Thank You, Bethel Park Education And Community Foundations! 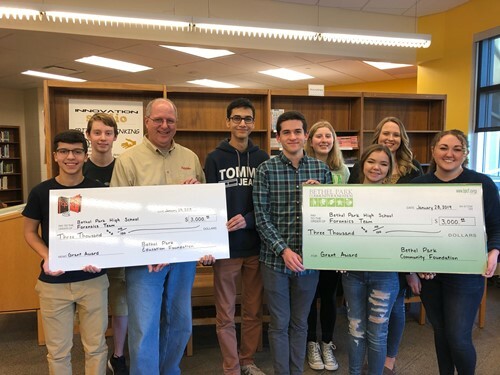 The Bethel Park High School Forensics Team received checks from the Bethel Park Education Foundation and the Bethel Park Community Foundation. Both checks were valued at $3,000. The check from the Community Foundation will be used to sponsor the annual Black Hawk Forensics Tournament that will take place at the High School on February 8 and 9. The check from the Education Foundation will help to defray expenses when the Team travels to higher level competitions such as the State and National Forensics Tournament, as well as the Harvard Tournament. Thank you, Bethel Park Education Foundation and Bethel Park Community Foundation, for helping to support the BPHS Forensics Team!